Bought a 52 degree wedge a couple of weeks ago and i have been very impressed. These spin the ball easily so accurate chips very easy. Nicley balanced, good weight with an excellent grip. The milles face is also very impressive and overall represents very good value. The "slot thru" design near the heel of the sole allows sand & grass to channel through giving you less resistance and a more fluid feel on your follow through. Good looking wedges, CNC milled to be flat with UV grooves. No problem getting spin on the ball. In fact, the grooves will peel the ball covering like a file if you typically swing fast. 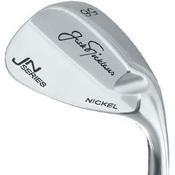 Nicklaus does not advertise these very much, but if you get a chance to hit these wedges, you will likely be pleased. Incredible value too.